Summer means a lot of things, but most of all, for your dog, it can mean blazing hot days. Some dogs are more acclimated to high heat than others, but when us dog parents see our dogs excessively panting, we want to do anything we can to keep our friends cool. Of course this is a no-brainer, but if you’re hot, so is your dog. The difference is he or she has a lot of hair on top of his or her body, and doesn’t exactly sweat the same way we do. The best remedy to keep your dog comfortable is to keep your house cool by opening windows, turning on fans, or running an air conditioner. If you don’t have an air conditioner, are worried about it operating safely while you’re gone, or you’re worried about electricity costs, another idea is when you’re not home to crate your dog in your basement… Assuming you have a clean or even finished basement. Remember, heat rises, so the further from the top level of your home you can get, the cooler it will be. By now we’ve all seen the owners that leave their dogs in the car with all the windows sealed up and we’ve thought — who would do that? But even leaving your dog in the car with the windows down or cracked, for as little as ten minutes, can really take a toll on your pooch. On an 85 degree day, a car can reach an inside temperature of 102 degrees in just ten minutes! Leave your friend at home in your cool home, bring him with you, or leave the AC running for him. Your dog might be begging to go for a walk, but keep in mind that if you walk on paved sidewalks or streets, that black asphalt can scorch your dog’s paws. Before you bring your dog out to walk, go outside and put your hand on the pavement. If it’s too hot for your hand, it’s too hot for your dog. Maybe try taking her to a grassy area or a park to work off some energy and get exercise, just make sure you bring lots of water for both of you. If your dog loves the outdoors, you might have a hard time dragging them in. But if you don’t have a lot of shaded areas around your home, you might want to make sure that your dog doesn’t spend too much time outside during a heat wave. Even if your dog does like to pretty much live outside, make sure they’ve got shade, plenty of water, and a place to lay down… Try to avoid dog houses as they can be stuffy and don’t let a lot of air through. 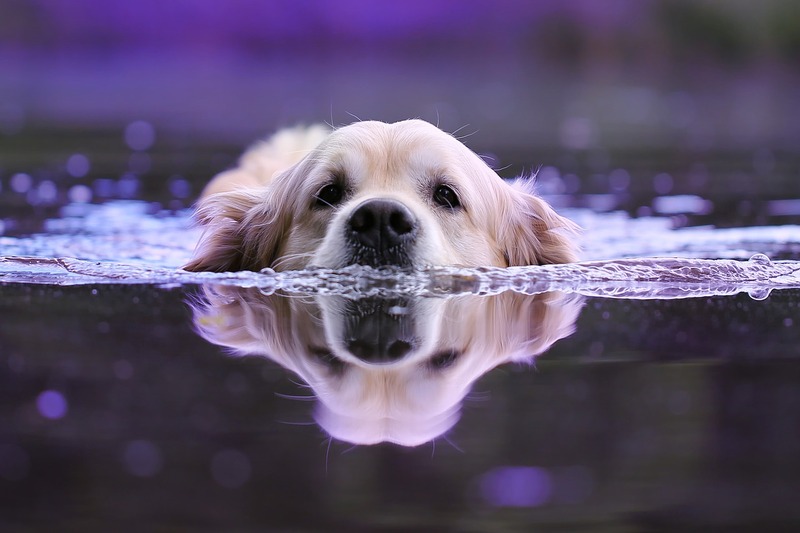 If your dog loves water, you might even want to fill a kiddie pool for them to play around in. Be careful of ice cubes as your dog can chew them and possibly break a tooth, but try filling a treat toy like a Kong with a treat — like peanut butter — and putting it in the freezer. Your dog will love the cool snack! What do you do to keep your dog cool during the summer? Let us know in the comments below!